Get to Aachen-Rothe Erde with regional trains via Cologne main station which is perfectly connected to the German ICE network. From Aachen-Rote Erde take the bus line 66 to 'Parkhaus/Schmiede' (final station) and change car to line 84 heading to 'Widdauer Weg' and exit at the 'Höfen Kirche' stop. Motorway A 1, take the exit no. 111 'Wißkirchen' and follow the federal highways B 266 and B 258. There are parking opportunities at the roadsides. From Aachen-Rote Erde take the bus line 66 to 'Parkhaus/Schmiede' (final station) and change car to line 84 heading to 'Widdauer Weg' and exit at the 'Höfen Kirche' stop. From here it's only a 6 minutes to walk. The "Wildnis-Trail Nationalpark Eifel" (Wilderness Trail Eifel) is a long distance hiking track with a length of 85 km. It is divided into 4 stages; hence it takes 4 days to hike it once completely. Of course it's not compulsory to hike all four stages – naturally it's possible to pick just one or two, no problem at all. But hiking the entire track is a very special experience, as the landscape there is really phenomenal. The track crosses the National Park Eifel which was established as the first National Park in North Rhine-Westphalia in 2004. The park itself covers more than 10,000 hectare. The comprehensive "topic" of this trail is "wilderness" in the truest sense of the word. Compounds which were used agriculturally or were under foresty use formerly are to be recycled back to the original state – wilderness. One example: in December 2007 the hurricane "Kyrill" damaged large parts of the spruce forests. This wasn't rebuilt at all but rather left as it was in order to let the nature – the wilderness – do its work. 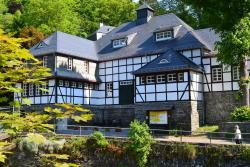 The "Nationalparks-Tor" (National Park Gate) in Monschau-Höfen, which is the initial point of the first stage, there is a large exhibition area with documentation center about the National Park Eifel. Visitors get comprehensive informations there. The first stage, leading from Monschau to Einruhr, is the most ambitious one: 24.7 km long with ascents of alltogether 571 meters and descents of alltogether 761 meters. One should schedule 6.5 hours for this first part. During the hike on this stage one will find the destroyed spruce forest which was already mentioned above. Doing nothing (and let the nature do) is called "process protection" by the experts. Furthermore there are alluvial forests and meadows with rare plants to be viewed. Untouched nature in its essence – this is what the visitors will get. The second stage leads the hiker from Einruhr to Gemünd. This part of the trail is 20.5 km long, and the ascents are alltogether 600 meters, the descents 659 meters. One should consider 5 hours for the second day. Rather than during the first stage with predominant forests here one will see wide grassland. Up to 2005 a large part of the area was used as military training area by the NATO, and the entire area is formed by tanks and grenades. Before this the "Obersee" and the "Urftsee" are passed – both barrier lakes. The third stage leads from Gemünd to Heimbach. Initially the path leads along the Urft shore back to western direction, then it goes uphill through the Böttenbach valley to Wolfgarten, then along the eastern edge of the "Kermeter" mountain range to the trappist monastery "Abtei Mariawald", before the path finally leads steeply downhill to Heimbach. With a little bit luck the hiker can see one of the shy wildcats which live in the beech forest. This part of the track is 22.4 km long, one should estimate 5.5 hours. The ascent is 469 meters, the descent 593 meters. The fourth and final stage, leading from Heimbach to Zerkall, is the easiest one: 17.7 km long with an ascent or alltogether 413 meters and a descent of alltogether 442 meters. The hiker should consider 4.45 hours for this part. The trail is dominated by oak forests of the "Hetzinger Wald" ("Hetzingen Forest") here. The visitors cross the "Rureifel" (named after the river "Rur"), the Schliebach valley, and the trail ends at the confluence of the rivers Kall and Rur. The final point is 175 meters above sea level and hence the lowest point of the entire track. Along the trail there are a couple of hotels to stay for the night(s). The visitors can arrange their accomodation by themselves, but there are special arrangements available: book a package with accomodation as well as luggage transport ... and after four days a re-transport to the initial point in case you came by car. The Wildernis Trail Eifel is a hiking trail for people who love the extraordinary. Enjoy it! The NS-Ordensburg Vogelsang (Burg Vogelsang) is a building looking like a castle upon the Erpenscheid mountain near Gemünd/Eifel. The building complex was a school for young executives in the Nazi party between 1936 and 1939. It's landmarked nowadays, and it's the second largest legacy of the Nazis in Germany. Guided tours are available, and a large exhibition about the Nazi era, as well as a second exhibition about the National Park Eifel will follow. The historic Mustard Mill in Monschau (Historische Senfmühle) is more than 100 years old, and nowadays the 4th and 5th generation of the same family is producing all sorts of mustard here. Guided tours are available: learn all about the history and the production of mustard. Of course it's possible to purchase your favorite sorts. A restaurant ("Schnabuleum") and a wine cellar with international wines and champagnes complete the offer. The "Greifvogelstation Hellenthal" (bird of prey station Hellenthal) is a falconry as well as a deer park for young and old people. Learn all about the bird of prey during spectacular shows and demonstrations, and/or relax by viewing boar, deer, lynx and way more wild animals. For the kids there are goats, rabbits, sheep and donkeys to pet as well as an "Indian village" where they will experience their ultimate adventure. This 4 star hotel located in the historic spa of Aachen offers modern, spacious rooms, and a 24 hour reception. The breakfast buffet is generous, and the restaurant offers tasty meals. The hotel itself ist just 2.5 KM distant from the German, Belgian and Dutch coutry triangle and is close to the A4 motorway as well as to good public transportation. A large indoor pool and a hearty breakfast buffet are offered at this 4-star hotel in Monschau. Surrounded by well-signposted hiking and cycling trails, it is just 5 km from the Belgian border. 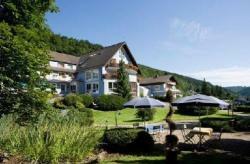 Nestled among densely forested mountains and close to the picturesque lake Rursee, you find this hotel within the most beautiful part of the Eifel region. Located 800 metres from Monschau town centre, these comfortable apartments have free Wi-Fi, fully equipped kitchens with dishwashers, and a private terrace. A hiking trail begins outside your front door.